Torre Coldai hangs ominously above the Civetta ski area in Alleghe. If you are looking for a route in an alpine setting, somewhere that really feels wild and has fantastic quality routes, this is the place. The approach is either quite easy if you ski down to it, or a bit of a slog if you get there on foot. Having done both, the 6 euro ticket (2019) from Piani Pezze to allow you to approach by ski was well worth it. Start from the lift station at Piani Pezze, walk up the ski runs towards Torre Coldai, the obvious and closest tower. 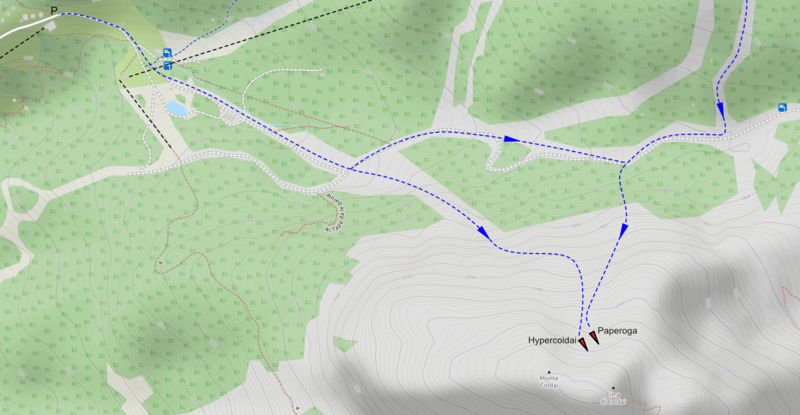 After a few hundred metres you will reach a junction in the ski run. Here you can either continue directly up the bed of a stream or turn left and continue up the ski runs, increasingly steeply until you can go right through low scrub. The slope above the junction is long, maybe 300m of ascent on either loose rubble or snow. Eventually you climb into a deep corner where you will start to see both Paperoga and Hypercoldai. A fantastic route which is a full notch easier than Hypercoldai, Paperoga is the first cascade you come to in the gully. Optional entry) WI2+ 40m, Low down there is an entry pitch which can be taken a number of ways, or which can be circumnavigated by climbing higher up the gully and traversing left, especially after snow. 1) WI3+, 50m The main cascade can be taken anywhere across it’s width, possibly slightly steeper the further right you go. Climb 30m up a shallow gully to reach a small cave where there is a rock belay, three old pegs and cord. 2) WI2+, 40m Continue for 40m past a narrowing to a rock belay on the right wall of the gully. 3) WI1, 30m Continue up easy ice to a further rock belay, pegs and tat low down on the right, possibly behind an ice stalactite. You can continue above for another couple of pitches at a lower grade. Abseil the route from belays and abalakovs. Belays are in a mixed state of deteriation, take tat and possibly some pitons to supplement the belays. The length given does not include the lower pitch or snow slope transitions. 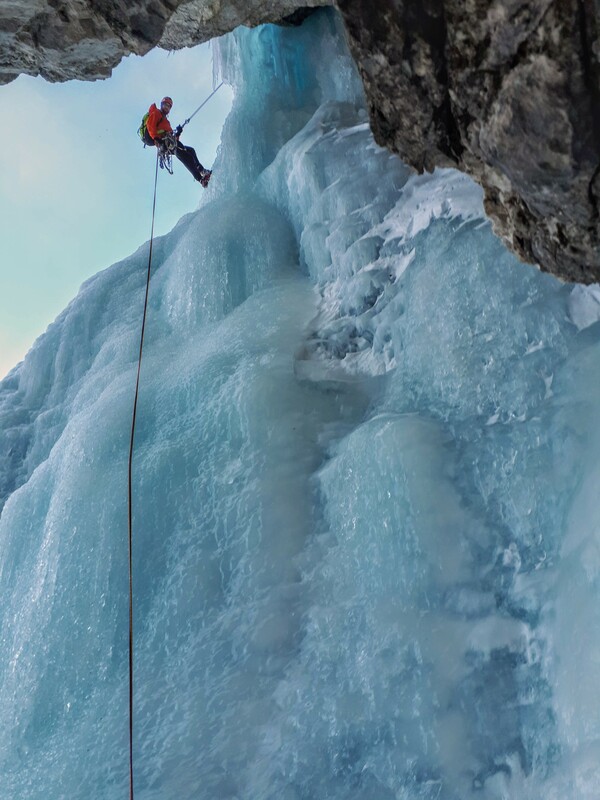 This is a world class route – the setting, the ice formations, the climbing it self all add up to make a super special routes. The first couple of pitches are clearly the crux but there are still sections of tough climbing after this. Continue up the gully past Paperoga until you reach a rock outcrop on the right side of the gully where you will find a rock belay. In general, a small set of nuts was useful on the route to back up pegs. 1) WI4, 35m Climb a surprisingly steep wide section of ice in a gully to a cave on the right where you will find a three peg belay. 2) WI4, 50m Traverse diagonally left to climb around a curtain of ice to a sloping ledge. Now either climb directy with difficulty (4+) or much more easily up to the left. On the right bank of the gully there are two rock belays, the second is better than the first as the pegs appear quite rotten on the first. 3) 60m climb the gully on snow to a corner. There is a thread high up above the niche before the ice steepens again, but the slings are old – an abalokov is probably a better option. 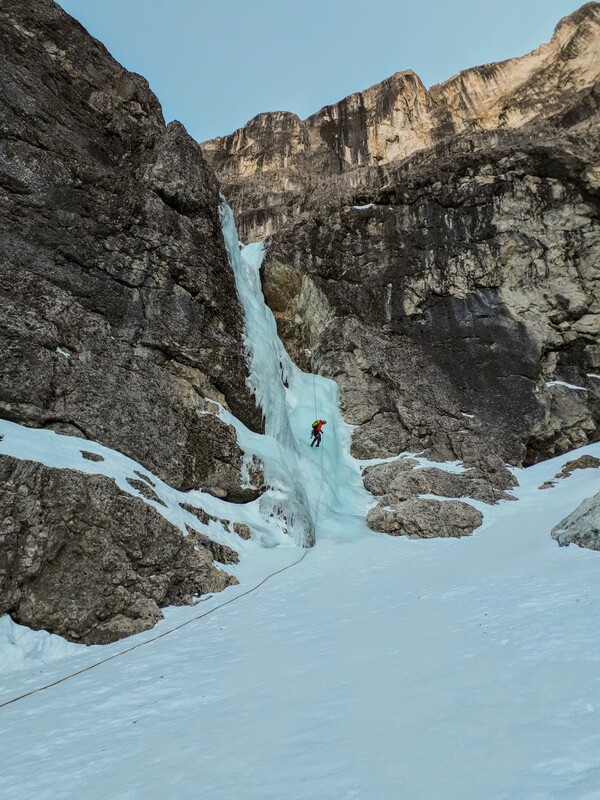 4) WI3+, 60m climb ice in a series of steeps to a cave where you would expect a belay. Step left on thin ice and rock to reach a niche. Descend on abalokov threads and peg belays.